Welcome at TSUNAMI SURFING SCHOOL! 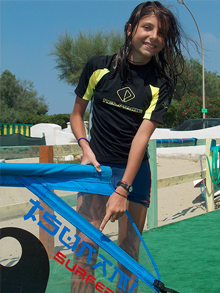 A school to learn all the secrets of the most beautiful water sports: the windsurf! 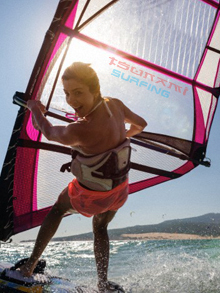 If you want to learn all the secrets of Windsurfing, experience the thrill of racing the waves and the freedom to live in harmony with nature, this is all summed up in going windsurfing. When do we start? Highly qualified staff for the professionalism, competence, especially towards the children. Our boys are at your disposal for any training or sport you desire. Whether you are a beginner or an absolutely fasting Windsurfing, they will lead you in this wonderful world. Areas reserved exclusively for lessons ofwindsurf, SUP and kayak. Nothing is left to chance. At our school, nothing is left to chance: changing rooms, area for lectures, reserve releases in the water for safety. You will learn in all serenity and tranquility. For over 30 years we train students passing all the passion of these sports. Too often teaching is delegated to approximate figures or arranged. At our school this is strictly prohibited. 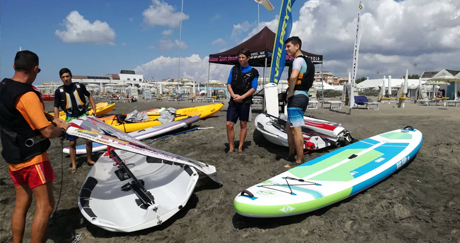 We adhere to the strict standards of the federation of WINDSURF imposing our instructors teaching high ability and strong teaching skills. Training for all ages and levels. 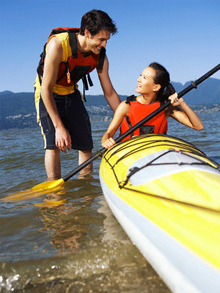 Whatever your preparation, we will be able to consent to a constantly changing all water sports. Individual and group courses for manageable schedule and duration. Daily lessons on how to learn this new sport. Practice on sand and gaits in water quality for the best performace and fitness. Sport for all: men, women and children. Lessons on how to do the paddling tours, sports and fitness. Outputs for group exercise with trails in the National Park of Circeo (Lago di Paola). Paddling surrounded by natural beauty. The boys have finished school? Leave them to us! We will spend a whole week of sport and entertainment. 5 days of Windsurfing, SUP, Kayaking, Sailing and SURF. Fun for all!